I began work on this book in late 2015 and it was published this Spring. The turnaround on reprint-only anthologies is really fast. There’s only minor editing; the bulk of the time investment is in selecting the stories. This was a follow-up to the popular Funny Science Fiction antho from last year and it’s doing quite well. If you don’t yet have a copy, grab it here. I’m really excited about this book as it is my first hard SF anthology. I turned the manuscript in to the publisher (Arc Manor/Phoenix Pick) a couple of months ago and the book was copy edited, proofread and laid out. The ARCs (advance reading copies) are being sent out to reviewers as we speak and the book will be published in October. The book is in the very final stages of copy edits, about to be sent out to the layout designer in the next few days. I’m falling a week or two behind schedule on this one, but not severely so (UFO4 was delivered to the designer on June 30 and was published on schedule.) 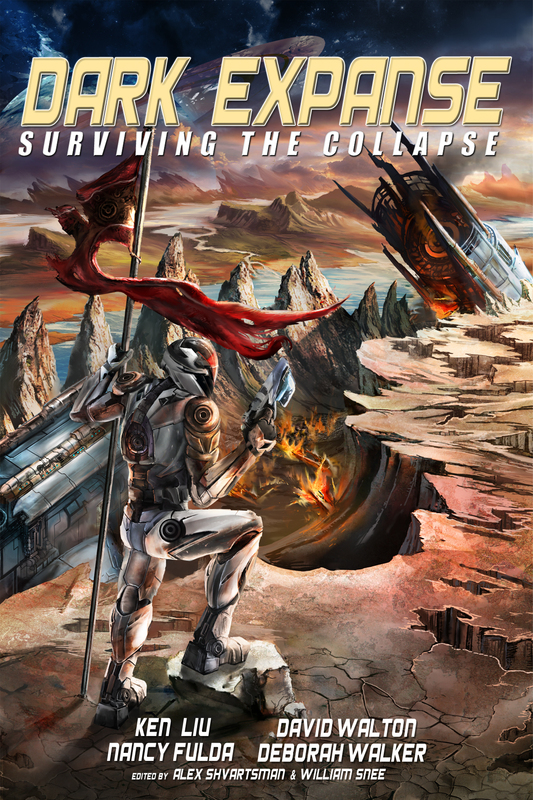 I’m hopefuly we will once again have it in time for a Capclave launch in October. This project I’m really behind on. I’m sitting on a number of stories I consider for inclusion, but there’s a lot more reading to do, and I haven’t had the chance to do it yet. My goal is to allocate some time to this in the coming month. I would rather push back the release than publish the book with less than 100% of the stories I really like, so the amount of great content I find will dictate the release date for this one. I’m weeks if not days away from announcing another anthology project, and I pretty much guarantee both the fans of my writing and fans of my anthology work will dig this one. I can’t say more until the ink is dry on the contract, but as soon as that happens, the announcement will be made! This anthology will likely be released in late 2017 or early 2018. This is slated for sometime in 2017; I haven’t done much work but I’m sort-of passively collecting great stories. I hope that, by the time I roll up my sleeves on this project for real (likely late this year) I will have a good chunk of the book filled. There will, of course, be more volumes of UFO for as long as I have the health and the financial means to publish them. I’ve done no work on this one at all, as I typically begin inviting headliners and laying out other groundwork once the previous volume is off to the printer. So I will begin contacting headliners later this summer or early autumn. UFO6 will definitely have an open submission window, while most other projects will be filled by invitation and/or recommendation when it comes to reprints. If you know of a funny story that was published elsewhere and fits the science fiction or horror genres, I’d love to hear about it. If I like it enough, it will make it onto my consideration list and eventually I will solicit FSF2 and FH anthologies from the stories on that list. I will be editing another anthology of science fiction humor over the summer. Tentatively titled FUNNY SCIENCE FICTION (Hey, it gets the point across, okay? ), I envision it as being “just like the Unidentified Funny Objects anthologies, except it will all be reprints.” There are lots of funny stories out there that I love, and would have published in UFO without hesitation, except other editors got to them first. Still, it’s virtually impossible for anyone to read all the magazines and anthologies out there, and so I’m confident the anthology will feel fresh to the fans of the UFO series. You can expect the same variety of voices, styles and lengths, and the same wacky and occasionally difficult-to-peg down sense of humor. 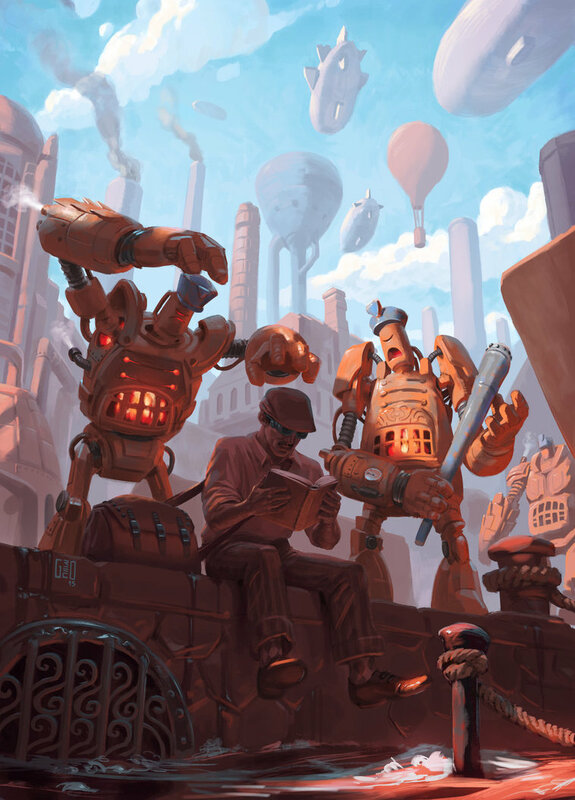 The awesome picture displayed above is by Argentine artist Flavio Greco Paglia will be the cover art for this book. Those are some of the similarities to UFO, but lots of things are different, too. For one thing, this will be an e-book only release, at least for now. UFO books sell way better as e-books than in paper (partly because UFO Publishing is a tiny company with limited distribution). Also, e-books are way cheaper to produce. I can afford to do this on a shoestring budget and without a Kickstarter campaign or causing undue emotional harm to my wallet. In case the book is super successful, I’m optioning the Print rights from authors. (As in, I will pay them a bit more money and be able to release the book in a print version.) Authors will be paid $0.01 per word for non-exclusive electronic rights outright, and another $0.01 per word if and when I want to exercise the print option. It’s not a lot, but unfortunately $0.01-$0.02 per word is pretty standard as reprint rates go. Ultimately I do not expect to make a ton of money from this project, but to use it as a way to promote the UFO series. The second difference is that this book will include science fiction stories only. No fantasy. However, if it proves to be successful, the FUNNY FANTASY volume won’t be far behind! I have a fairly broad definition of science fiction, which includes superheroes, steampunk that doesn’t include magic, etc. Also, there will be no submission window for this project as such. About half the stories will be solicited by me directly — they’re stories I’ve already read, I already love, and I will definitely include in the book if the authors let me. For the rest, I’m asking readers (and authors themselves) to recommend reading material to me. I’m looking for stories of 500-7500 words that are SF and that are funny. Please feel free t0 e-mail me, or simply post your favorites in the comments of this post. If you’re an author, it’s OK to recommend a few of your own stories. I’ll do my best to read everything that’s suggested, and may reach out to some authors directly and ask them to see their stories if they weren’t published online. I’m looking to mostly include stories that were published in the last few years. (Original publication date of 2010 – present.) I may go back a few years more for my absolute favorites, but will include nothing from the 20th century. The idea is to showcase some of the best humor SF being written today. Go far enough back and the book will become filled with time-tested classics by Brown and Asimov and Sheckley, leaving little room for modern stories. I’m super excited to share these stories (and several others I’ve already solicited and am waiting on responses and/or contracts) with my readers. I’ll be reading and slowly acquiring stories for this project over the course of the next month or so. Again, if you have a (recent) favorite, please let me know about it in the comments, on Twitter, Facebook, by carrier pigeon, or at a convention. Thanks! Announcing the table of contents and cover for Dark Expanse: Surviving the Collapse, edited by yours truly and William Snee. 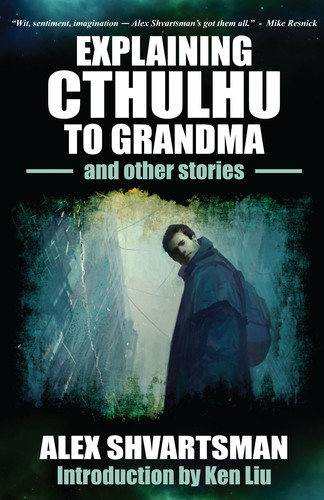 This is a collection of 18 short stories set in the universe of the Dark Expanse video game. This book will premier on Amazon in March 2014. 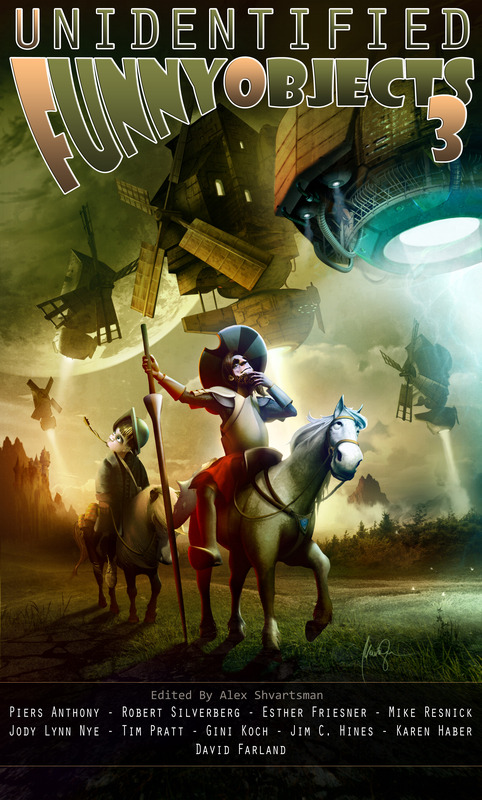 UFO3 Kickstarter campaign will be ending on Tuesday evening. As of the time I’m writing this, we raised just about $5500 but there’s still a long way to go. If you like the series and would like to see it continue and prosper, please consider pre-ordering your copy of UFO3 through the campaign instead of waiting until the book is released. Getting access to the funds early will allow me to invest into buying more stories, promoting the book and the series better, and commissioning more pieces of interior art. In addition to all the UFO books there are unique cool rewards available, such as becoming a character in stories written by Gini Koch and by me, getting a critique for one of your own stories, or even having your name mentioned in the foreword. There are also prints of the gorgeous cover art above, which can be added to any pledge level for an additional $10. I really enjoy editing the UFO series. Although I hope it will turn a profit someday, I have not taken any pay to date, and have invested a lot of my own money on top of what’s been raised via Kickstarter to publish and market previous volumes. UFO is growing, but at this rate it will be a few years yet before it becomes self-sustained (especially since I want to keep raising the pay rate for authors as aggressively as possible). So if you’re able to help out — whether by pledging any amount, or letting other readers know about the campaign — please do. Thank you! Each time a new book is released into the world is a little bit like a birthday. 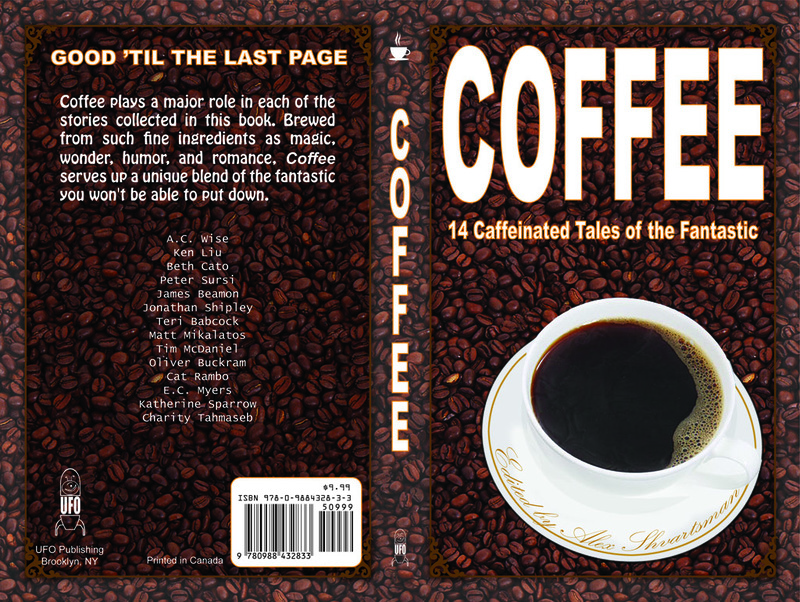 Today I had the pleasure of e-mailing the COFFEE e-books to our Kickstarter backers, and folks who were kind enough to pre-order them. Tomorrow I expect to spend much of my day packing physical copies. I’m very excited about this book, and can’t wait to share the end result with the world. For those of you who didn’t back Coffee on Kickstarter (and why not, I ask?! ), you can order your very own copies at UFO Publishing Buy Our Books page. 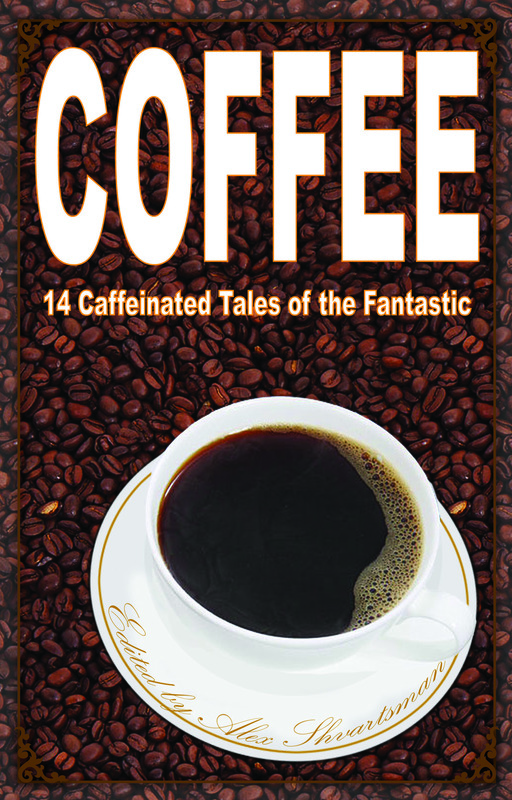 It’s only three bucks for an e-book, which is cheaper than an actual cup of coffee, if you like yours Venti or Grande. And if you do not already own copies of UFO1 or UFO2 (and why not, I ask again?! ), we have a Holiday Bundle special where you can get all three physical books for $30 or all three e-books for $12. Follow that same link to take advantage of it. The special will only last until December 9th. And if you absolutely must get it on Amazon, here’s the link to the paperback. E-books should be popping up on Amazon, B&N, Kobo, and Smashwords by the weekend. Remember: books make great holiday presents! OK, I’m done with the hard sell now. Really.